Cage-farmed oysters in Grande Isla, LA (Louisiana Cultural Vistas. Fall 2016). 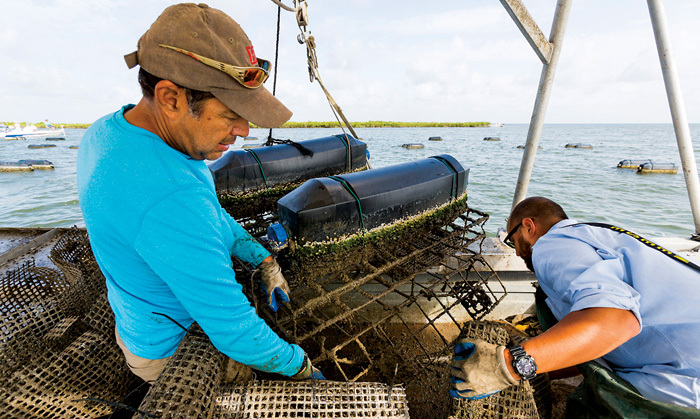 As the first day of summer approaches, farmers arrive at Louisiana State University’s Sea Grant oyster farm in Grand Isle to pick up their seed. The farmers express gratitude that Dr. John Supan has, with the help of his team, grown their oyster seeds a bit bigger than required. The pinky-nail-sized larval oysters look like a pile of mushy sand until Supan’s crew rinse and separate them from each other. The tiny oysters yearn to attach to anything, but each of these will live its entire life autonomous and untethered from rocks and fellow oysters. In the process of packing the seeds into small sacks of 50,000, three of the tiny larvae fall to the ground. This goes unnoticed by no one. The farmers purchase the two-millimeter larvae through the Louisiana Oyster Dealers and Growers Association for $300 per million, or $11 per thousand. Traditional oyster larvae face all manner of challenges, and most never make it to adulthood, but the cage farmers expect almost all of these seeds to grow.